Almost two-thirds of adults in West Sussex are overweight or obese and one in ten smoke. The figures were included in a report from the health and wellbeing board which painted a picture of life in the county from cradle to grave. It proved to be a rather mixed picture, with areas of improvement and others of concern. On the plus side, the number of pregnancies among 15-17 year olds fell by more than half between 2005 and 2016, from 31.3 per thousand to 12.2 per thousand. The number of deaths from cardiovascular disease among the under-75s, including heart attacks and strokes, fell dramatically from 88.6 per 100,000 in 2004/06 to 62.7 in 2014/16. On the negative side, 7,000 adults have an alcohol dependency and almost one-in-five people take no physical activity. Some 8.4 per cent of pregnant women smoked right up to the time of delivery, and less than half of mothers were still breastfeeding six to eight weeks after their babies were born. While women have a longer life expectancy than men – 84.1 years compared to 80.6 – their ‘healthy’ life expectancy has fallen. Men can expect to spend 15 years in poor health, but for women it’s 20. The report was discussed at a meeting of the county’s health and adult social care select committee, in Chichester on Wednesday (January 16). On this issue of obesity, Dr James Walsh (Lib Dem, Littlehampton East) said: “I’m concerned there is very little mention about sugar reduction. “To me it’s the biggest public health epidemic in the western world, never mind the UK, contributing not just to obesity but to diabetes and some cancers, and unless we do something about it, it’s going to be a much bigger problem even than smoking has been over the last century. Chairman Bryan Turner (Con, Broadwater) said he was often ‘disappointed’ to see young people smoking in Worthing. He recognised that some older people would never be convinced to drop the habit, but asked why youngsters were still taking it up. 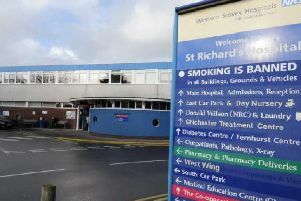 Anna Raleigh, director of public health, said that, in some areas of deprivation, smoking was part of the average way of life. Describing the behaviour as ‘very entrenched’, she said: “If you grow up in that environment where everybody smokes and you get some of those stories about ‘my grandfather smoked and he lived until he was 80 and he was fine’, that health literacy goes very unchallenged. Ms Raleigh laid out the goals and initiatives of the health and wellbeing board as well as the challenges faced by all involved.